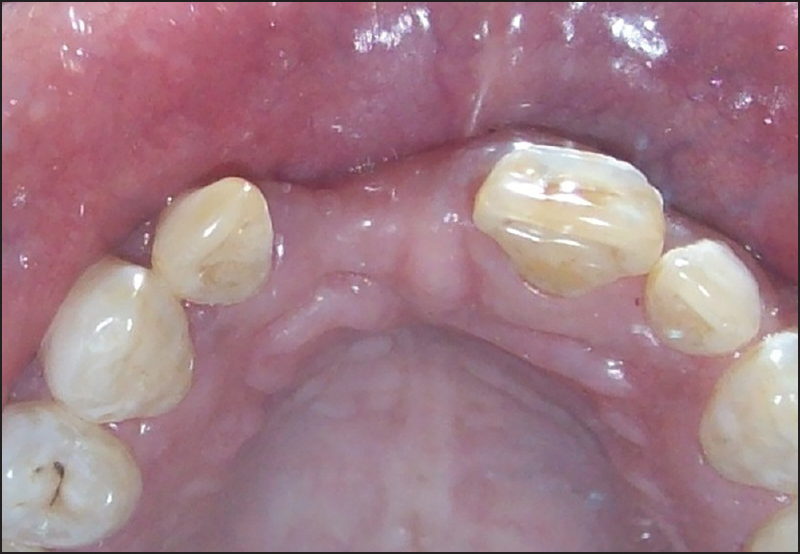 Background: Localized alveolar ridge defect may create physiological and pathological problems. Developments in surgical techniques have made it simpler to change the configuration of a ridge to create a more aesthetic and more easily cleansable shape. The purpose of this study was to compare the efficacy of alveolar ridge augmentation using a subepithelial connective tissue graft in pouch and modified connective tissue graft technique. Materials and Methods: In this randomized, double blind, parallel and prospective study, 40 non-smoker individuals with 40 class III alveolar ridge defects in maxillary anterior were randomly divided in two groups. Group I received modified connective tissue graft, while group II were treated with subepithelial connective tissue graft in pouch technique. The defect size was measured in its horizontal and vertical dimension by utilizing a periodontal probe in a stone cast at base line, after 3 months, and 6 months post surgically. Analysis of variance and Bonferroni post-hoc test were used for statistical analysis. A two-tailed P < 0.05 was considered to be statistically significant. Results: Mean values in horizontal width after 6 months were 4.70 ± 0.87 mm, and 4.05 ± 0.89 mm for group I and II, respectively. Regarding vertical heights, obtained mean values were 4.75 ± 0.97 mm and 3.70 ± 0.92 mm for group I and group II, respectively. Conclusion: Within the limitations of this study, connective tissue graft proposed significantly more improvement as compare to connective tissue graft in pouch. Class III defect (A combination of buccolingual and apicocoronal loss). Mild deformity <3 mm, moderate deformity 3-6 mm, and severe deformity >6 mm. Abrams et al. studied the prevalence of anterior ridge deformities in the mandibular and maxillary arches of partially edentulous patients and reported the presence of defects in 91% of the cases. Class III defects were the most prevalent (55.8%), followed by Class I defects (32.8%) and Class II defects (2.9%). In literature, little data is available about the comparison of subepithelial connective tissue graft in pouch and modified subepithelial connective tissue graft in the treatment of alveolar ridge defects. Therefore, to explore the beneficial effects of modified subepithelial connective tissue graft over subepithelial connective tissue graft in pouch, if any, in alveolar ridge defects the present study was undertaken. Forty non-smoker individuals (24 males and 16 females, age between 25 and 55 years) with 40 class III alveolar ridge defects in maxillary anterior region were selected for the study in the Department of Periodontics, Dr. Z. A. Dental College, Aligarh. The study was designed as a randomized, clinical study comparing the alveolar ridge augmentation outcomes using modified connective tissue graft and subepithelial connective graft in pouch. Inclusion criteria for the patients were absence of any systemic and periodontal diseases, not taking any medication, no pregnancy or lactation, not previously treated for periodontal reasons, cause of tooth loss be trauma, congenital missing, and tooth fracture. 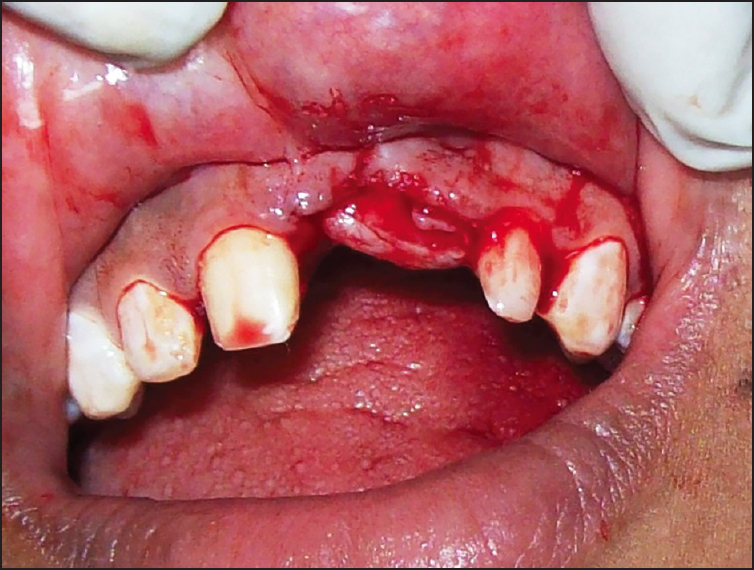 To be included in the study, each patient had to present <20% plaque (PL+), and bleeding on probing (BOP+) sites. Selected sites were randomly divided by flip of coin method in two groups. Group I was treated by modified subepithelial connective tissue graft (combined onlay connective tissue graft), while group II by subepithelial connective graft in pouch method. After recruitment of the patients, the study protocol, risks, benefits, and procedures were explained, and written informed consents were obtained from every patient. All the examinations, treatment, and procedures associated with this study followed the principles according to the Declaration of Helsinki. The study was properly reviewed, and approved by the Ethical Committee of Institute. Stone casts were prepared at baseline and after 3, and 6 months postoperatively for measuring the dimension of alveolar ridge defects. The extension of the ridge defect was defined as distance between the buccal-proximal line angles of both adjacent teeth at the vertical level of the papilla tips. It was measured with an orthodontic caliber (Zürcher Model, Medidenta Zürich, Swiss), having a division of one tenth of a millimeter. The result was rounded up to the next tenth of a millimetre. The measurements of the ridge defect was assessed on the dental cast with a manual UNC-15 periodontal probe (Hu-Friedy, Chicago, IL, USA) , in nearest millimetre by measuring the defect size separately in the vertical and horizontal dimension. The vertical component of the ridge defect was measured between the deepest point of the ridge defect to a line, which run through the adjacent papilla tips, named the papilla line. The horizontal component of the ridge defect was assessed between the deepest point of the ridge defect to the tooth arch curvature, which runs through the adjacent gingival zeniths, or the buccal cemento-enamel junction, respectively. The papilla line and the tooth arch curvature defined in a semiquantitative manner according the aesthetically ideal ridge form, which outlined the target volume for augmentation. Both lines were determined with a tin wire, having a circle round cross-section with a diameter of 1 mm, possessing no elasticity. In this manner, the ridge defect was semi-quantitatively determined at the mentioned time periods. The measured results were rounded up to the nearest millimetre. The absolute gain in the vertical and horizontal dimension, expressed in millimetres, was calculated by subtracting the postoperative from the preoperative value. All measurements were done by a masked clinician who was unaware about the type of surgeries. All surgeries were performed by single well experienced periodontist for minimization of the inter operator variability. 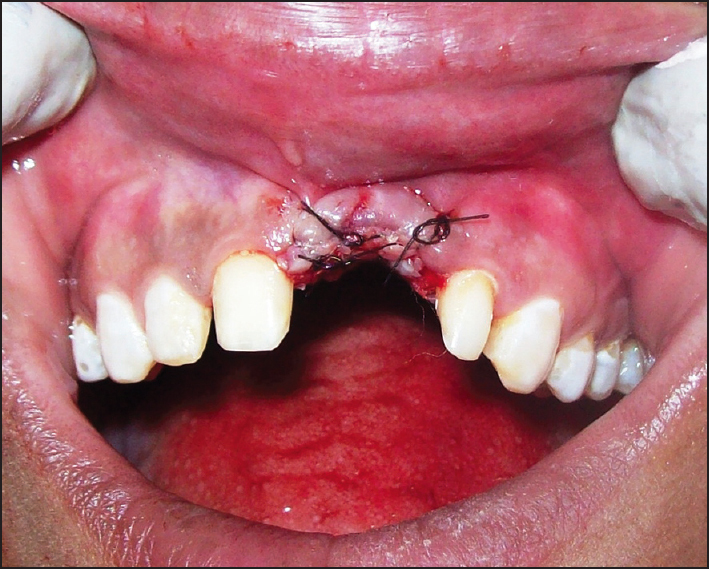 After administering local anaesthesia, incision was given for pouch formation at the buccal side of involved area. This pouch was extended to the alveolar ridge for adequate depth with the help of periosteal elevator. 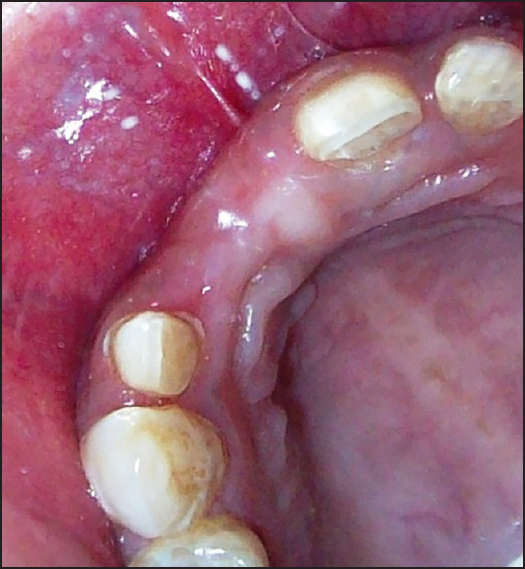 Subepithelial connective tissue graft was harvested from the palatal aspect of left second premolar region. This connective tissue graft transferred to the preformed pouch and adjusted according to ridge deficiency. After suturing, the site was covered with periodontal pack. Half of the graft's width remained covered with epithelium whereas in the other half of the graft's width epithelium was removed leaving connective tissue and fatty tissue. Therefore, this graft represented a combined onlay - Connective tissue graft. The onlay part of the graft was fixed on the palatal aspect of the recipient site. The connective tissue part of the graft was placed on the buccal aspect of the recipient site, correcting the ridge defect [Figure 1], [Figure 2], [Figure 3], [Figure 4], [Figure 5], [Figure 6] and [Figure 7]. Figure 1: Facial view of alveolar ridge deficiency. Figure 2: Occlusal view of alveolar ridge defi ciency. 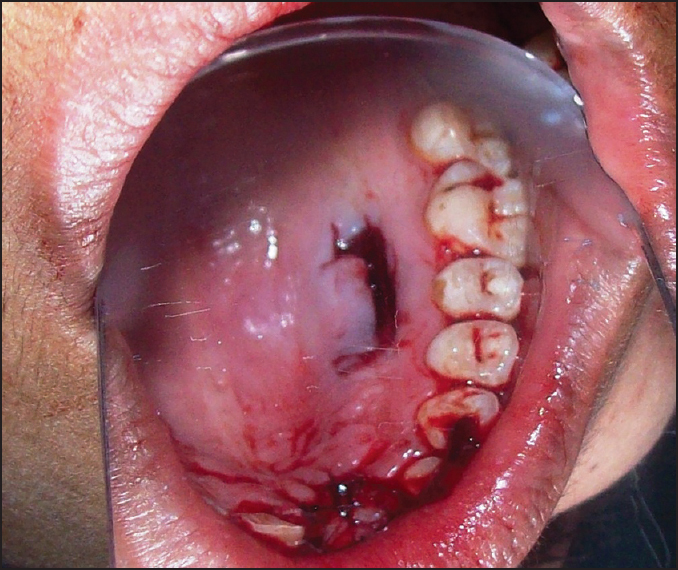 Figure 3: Donor site in palatal area after modifi ed graft removal. Figure 4: Modified connective tissue graft (note: onlay portion and connective tissue in same graft). Figure 5: Graft in recipient site. Figure 6: Graft suture at recipient site. Figure 7: Improvement in bucco-lingual width. (After 6 months). Postoperative regime included 500 mg amoxicillin and 125 mg clavulanic acid (Augmentin 625, GlaxoSmithKline) thrice a day for 7 days and 0.12% Chlorhexidine gluconate mouth rinse (10 ml; Peridex, Procter and Gamble) twice daily for 2 weeks. Recall sessions were made at biweekly intervals for periodontal examination for professional tooth cleaning. Analysis of variance and Bonferroni post-hoc test were used for statistical analysis. A two-tailed P < 0.05 was considered to be statistically significant. All patients maintained a high standard of PL control throughout the study, and all the defects healed with no infectious episodes or uneventfully both clinically and radiographically. The controls showed %PL+ and %BOP+ sites of 14.4% and 15.2%, respectively at base line; the same parameters were 13.3% and 14.1% after 6 months. Similarly, for the group II, %PL+ and %BOP+ were 13.8% and 14.6% at base line and 12.8%, and 14.0% after 6 months. Both groups showed a nonsignificant change in %PL+ and %BOP+ at base line and after 6 months. The mean mesio-distal width of the ridge extension was 12.8 mm in group I, and 13.0 mm in group II. Both techniques showed significant horizontal and vertical fill after 3 and 6 months as compared to base line dimensions. On inter group comparison group I demonstrated significantly better results than group II in terms of mean change from base line to 3 and 6 months for both horizontal and vertical defect fill. Mean gain in horizontal width after 6 months was 4.70 ± 0.87 mm, and 4.05 ± 0.89 mm for group I and II respectively. While increase in vertical height was 4.75 ± 0.97 mm and 3.70 ± 0.92 mm respectively for group I and group II [Table 1] and [Table 2]. This study was undertaken for the assessment of ridge augmentation capacity of subepithelial connective tissue in pouch, and modified subepithelial connective tissue graft (combined onlay - Connective tissue graft) for class III alveolar ridge defects. Both treatment modalities proposed significant horizontal and vertical gain in ridge height after 3 and 6 months as compared to base line dimensions. However, modified subepithelial connective tissue graft observed significantly more gain than connective tissue graft in pouch for the same parameters. The intragroup results of our study were in agreement with previous literature in which above mentioned techniques have showed significant improvement in horizontal and vertical ridge height. ,,,,,, However, intergroup results of present study were not in accordance to Studer et al. study. 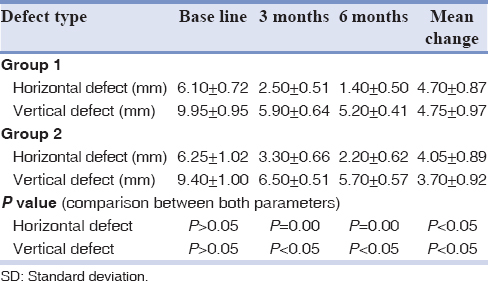 In this study, preoperative defect size did not differ statistically from each other in both groups, either in the vertical dimension (P > 0.05) or in the horizontal dimension (P > 0.05), as well as for the extension of the defect size (P > 0.05). The observation time was also similar for both surgical groups. 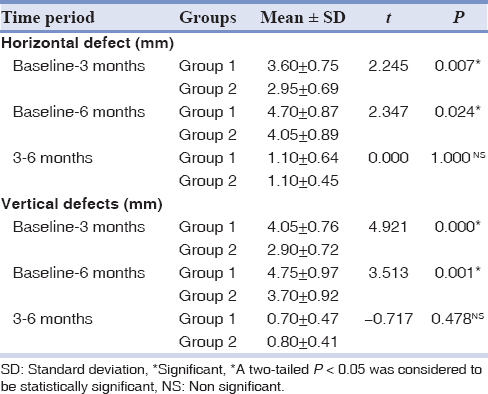 This allows the conclusion that both groups possessed the same presurgical conditions regarding defect morphology; therefore, differences between these groups which were determined after surgery were not related to presurgical existing differences. The submerged connective tissue section of the graft aids in the revascularization of the onlay section of the graft, thereby gaining a greater percentage of take of overall graft. 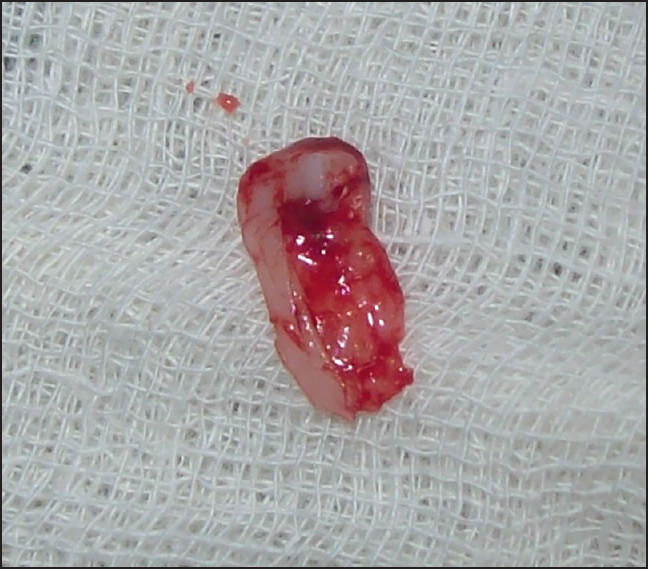 A smaller postoperative open wound in the palate donor site. Faster healing in the palate donor site with less patient discomfort. Greater latitude or ability to control the degree of bucco-lingual and apico-coronal augmentation within the single procedure. Vestibular depth is not decreased and the mucogingival junction is not moved coronally, thereby eliminating the need for follow-up corrective procedure. For the present study a simple and economical measurement method was applied, which allowed a fast and easy assessment of ridge defects prior to and after surgery. The drawback of this method lies in its limited precision, and the location of the defect size assessment does not necessarily remain at the same location between the pre- and post-operative measurements. Consequently, this measurement method may be defined as a semi quantitative one. The alternative for the assessment of three-dimensional volume differences could be the projection Moirι technique. This method offers volume assessments with sufficient accuracy. However, it is time-consuming and demands significant computer equipments. , It would be of interest to measure the present data with the Moire projection method and compare its results with the present study, possibly establishing the presented method as a fast control method. It must be critically commented that the aim of the ridge augmentation procedure was to augment "as much as possible." The exact graft volume which was placed in the recipient site was not measured in this study due to its limited accuracy. The known graft volume would possibly give more accurate information about the efficacy of different surgical procedures, if the volumetric outcome is quantitatively assessed, e.g., by projection Moirι technique. Within the limitations of this study, modified connective tissue graft is a better option as compared to subepithelial connective tissue in pouch for the treatment of alveolar ridge deficiency. Thoma DS, Hämmerle CH, Cochran DL, Jones AA, Görlach C, Uebersax L, et al. Soft tissue volume augmentation by the use of collagen-based matrices in the dog mandible - A histological analysis. J Clin Periodontol 2011;38:1063-70. Thoma DS, Jung RE, Schneider D, Cochran DL, Ender A, Jones AA, et al. Soft tissue volume augmentation by the use of collagen-based matrices: A volumetric analysis. J Clin Periodontol 2010;37:659-66. Schropp L, Wenzel A, Kostopoulos L, Karring T. Bone healing and soft tissue contour changes following single-tooth extraction: A clinical and radiographic 12-month prospective study. Int J Periodontics Restorative Dent 2003;23:313-23. Allen EP, Gainza CS, Farthing GG, Newbold DA. Improved technique for localized ridge augmentation. A report of 21 cases. J Periodontol 1985;56:195-9. Abrams H, Kopczyk RA, Kaplan AL. 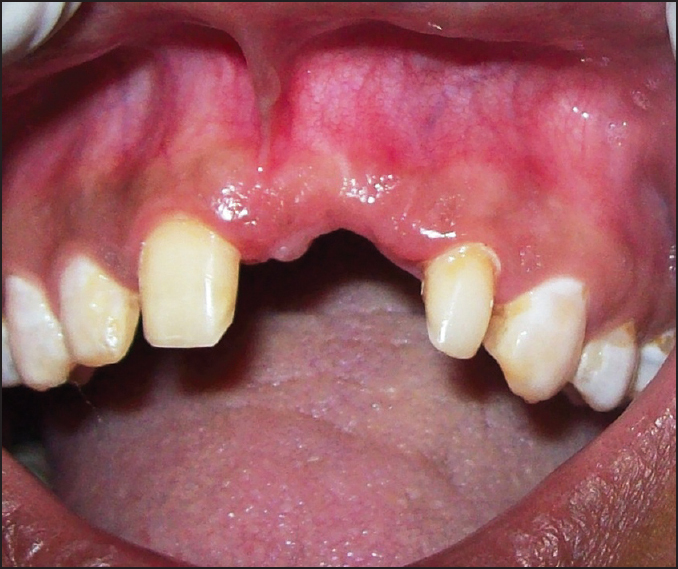 Incidence of anterior ridge deformities in partially edentulous patients. J Prosthet Dent 1987;57:191-4. Studer S, Naef R, Schärer P. Adjustment of localized alveolar ridge defects by soft tissue transplantation to improve mucogingival esthetics: A proposal for clinical classification and an evaluation of procedures. Quintessence Int 1997;28:785-805. Studer SP, Allen EP, Rees TC, Kouba A. The thickness of masticatory mucosa in the human hard palate and tuberosity as potential donor sites for ridge augmentation procedures. J Periodontol 1997;68:145-51. Seibert JS, Salama H. Alveolar ridge preservation and reconstruction. Periodontol 2000 1996;11:69-84. Walter C, Büttel L, Weiger R. Localized alveolar ridge augmentation using a two-step approach with different soft tissue grafts: a clinical report. J Contemp Dent Pract 2008;9:99-106. Seibert JS. Reconstruction of deformed, partially edentulous ridges, using full thickness onlay grafts. Part II. Prosthetic/periodontal interrelationships. Compend Contin Educ Dent 1983;4:549-62. Thoma DS, Benic GI, Zwahlen M, Hämmerle CH, Jung RE. A systematic review assessing soft tissue augmentation techniques. Clin Oral Implants Res 2009;20 Suppl 4:146-65. Studer SP, Kadl P, Glauser R, Schärer P. Semi-quantitative short-term results of three different soft tissue augmentation procedures in multiple tooth defects. Acta Med Dent Helv 1998;13:68-74. Studer SP, Lehner C, Bucher A, Schärer P. Soft tissue correction of a single-tooth pontic space: A comparative quantitative volume assessment. J Prosthet Dent 2000;83:402-11. Cohen ES. Ridge augmentation utilizing the subepithelial connective tissue graft: Case reports. Pract Periodontics Aesthet Dent 1994;6:47-53. Seibert JS, Louis JV. Soft tissue ridge augmentation utilizing a combination onlay-interpositional graft procedure: A case report. Int J Periodontics Restorative Dent 1996;16:310-21. Studer SP, Scharer P. Short-term volume changes of two different soft tissue augmentation procedures. J Dent Res 1994;73:222-7. Studer SP, Wegmann U, Bucher A, Yellen J, Scharer P. Comparison of measurement methods for a quantitative volume assessment of three-dimensional defects in oral plastic surgery. Acta Med Dent Helv 1997;2:7-15. Prato GP, Cairo F, Tinti C, Cortellini P, Muzzi L, Mancini EA. Prevention of alveolar ridge deformities and reconstruction of lost anatomy: A review of surgical approaches. Int J Periodontics Restorative Dent 2004;24:434-45.